Winter lures everyone around the world. With holidays around the corner, this season is full of festivals, soft and mushy landscapes and frosty peaks of hills. This season is the best excuse to load up with best winter foods. This season is cold, so your diet must provide warmth to the body. Nothing can beat a nice warm meal at the end of a hectic day on a cold night. Soups, fruits, vegetables, barbecues â€“ whatever you are into, there are surely a favourite winter recipe that suits your taste. The day usually starts with heavy breakfast consisting of high-fat content foods creating a myth that oil keeps the body warm. In this season, people tend to get lazy which leads to a weak immunity system. Therefore, you can begin your day with flavored teas and coffees. Green tea and chamomile tea are considered as one of the best winter foods. 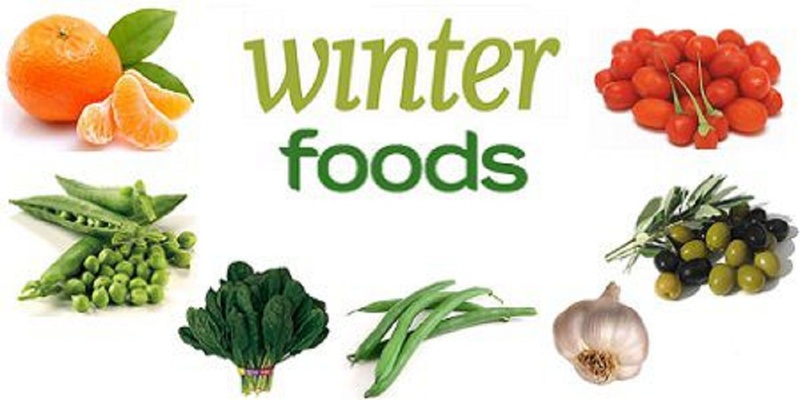 They are have abundant antioxidants that help your body to fight against cold and flu during winter. It is a myth that consuming alcohol will warm your body. Instead, it makes your blood cold. When you feel thirsty, consider drinking fruit juices instead of alcohol, as they will hydrate your body. Fruits like pomegranate, citrus, apples and guava are a healthier approach to winter diets. Vegetables like dark leafy vegetables, potatoes, carrots and butternut, acorn are rich in Vitamin A, which keeps you healthy in winters. Grilled fish, hams, kebabs and vegetables can serve as healthy snacks during this season. Mushrooms are the immunity boosters, which protects your body against cold and virus. Garlic is another energy booster which provides maximum potency if eaten raw. Honey and garlic are one of the best home remedies to cure cold and fever during winters. Soups and stews are so perfect for this season and will go down quickly and warm you fast. Hot fudge and brownies are some of the warm winter foods for the ones with a sweet tooth. Salty and bitter foods provide energy for your body that boosts the storage capacity of your body. Seafood such as fish can also be included in the winter diet. When weight is a concern, foods like baked apple can be your alternative.Â Baking cakes at home can be healthier as that includes less refined flour, which will cut down the calorie intake. Add a generous amount of dry fruits and nuts to make it tastier and healthier. Cooked whole grains such as buckwheat, oats, barley, millet, brown rice and wheat are good body heaters and make warming nutritious meal. This winter, take the time to cuddle yourself in a cozy place and nourish your body with warm soups, casseroles, and other best winter foods. Gorging on delicious food during this season is natural. Keeping a tab on what to eat is important. If you are particularly vulnerable to winter chill for example, have a tendency to catch cold or throat infection very fast, ensure to keep on drinking hot water. It will not only soothe your throat but also help you to feel warmer and better. You can also keep on trying some traditional age-old remedies for keeping yourself healthy during winter such as adding ghee to your food or using a chutney of fenugreek seeds to generate warmth within your body.